Scooby Doo is one of those timeless characters that reaches across to both children and parents alike with his madcap capers and craaaaazy, cunning, conundrums! Scooby Doo: Mask of the Blue Falcon is a brand new adventure for 2013 and tells of the goings-on at the 'Mega Mondo Pop Cartoon-a-Con with celebrated comic book characters headlining at the convention. However, all goes dramatically wrong (in pure Scooby fashion) when Mr. Hyde unleashes monster bats, howling hounds and sinister slime upon all the revellers. It's time for Fred, Daphne and Velma to help out Scooby and Shaggy to tap into their inner superhero to prevent the convention from being a wash-out. Included in this disc are bonus vintage cartoons (Comic Book Caper, Reflections in a Ghoulish Eye and The Scooby Coupe), alongside the opportunity to stream and download the movie onto computers, tablet computers and smartphones using Ultraviolet technology. Ultraviolet is such a clever piece of technology and makes it perfect for out and about entertainment by being able to download it onto a mobile device. 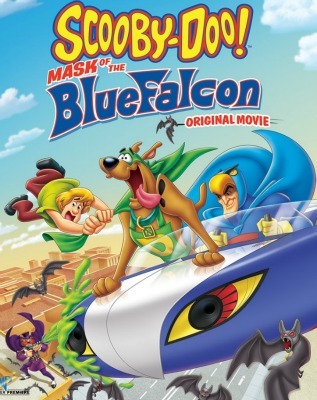 Scooby Doo: Mask of the Blue Falcon is available from Amazon priced at £9.99. I was sent a copy of this disc for the purpose of this post.